The video rolls into this office faster than it can be processed. American police have celebrated the nation's independence with a wave of public executions bringing the total number of unarmed black men killed to 115 in 2016. That is more than twice the number killed in the Pulse Nightclub massacre carried out by private security contractor and former prison guard Omar Mateen. As the police respond to the Black Lives Matter movement with a nationwide volley of gunfire, new laws to protect police are being inked into the books. In the case of Alton Sterling the police claim he had a weapon in his pocket, and appear to be pulling it out while he bled to death after being beaten and then shot in the back. The video that shows this was taken from a convenience store camera that the police confiscated without a warrant “for investigation.” That Baton Rouge police department is not the investigating agency in that shooting. That whitewash has been assigned to the FBI who recently exonerated Hillary Clinton and has failed to bring charges in any of the recent police murders of unarmed black people that have drawn national attention because of citizen video taping. In the case of Philando Castile, police shot him during a typical driving while black traffic stop after demanding his license. Essentially “Let me see your papers.” Blam. He bled to death in front of his girlfriend and her young daughter while the officer repeatedly said “I told him not to reach for it” for the benefit of the camera. Castile, like #HenryGreen, was licensed to carry and shot without warning, proving yet again that the right to carry in America is for whites only, just like the right to breathe. Just as the second video of Alton Sterling's murder was confiscated (although cellphone video from the same perspective has surfaced) the initial live Facebook video of the police murder of Philando Castile was removed from Facebook by Facebook officials. Facebook later permitted it to be viewed and gave a lukewarm apology after it went viral. This mirrors recent model legislation passed in Virginia to keep officers identities a secret in response to public calls for accountability. The Virginia secret police law has been doubled down on in Louisiana, which passed a #bluelivesmatter law. This law would make it a hate crime to target police officers for crimes, such as “resisting arrest” or “assaulting an officer,” presumably even by bleeding on them. This law is mirrored by proposed federal legislation that is currently in front of Congress. Congress seems to be united in a bi-partisan desire to protect police despite few actual crimes against them. On the same day that Philando Castile was executed for driving while black, Obama signed a new bill creating a nationwide alert system for “threats against police officers” including those made on social media. These “blue alerts” mirror the nationwide “Amber Alert” system for missing children. The law was passed by a unanimous voice vote of both Houses of Congress. It will create nationwide monitoring of what people say in response to the open daily execution of unarmed citizens by police. There is no nationwide system for tracking the police shootings of unarmed people. Those statistics are compiled by private watchdog groups that operate mostly without funding and in the face of official obstruction. 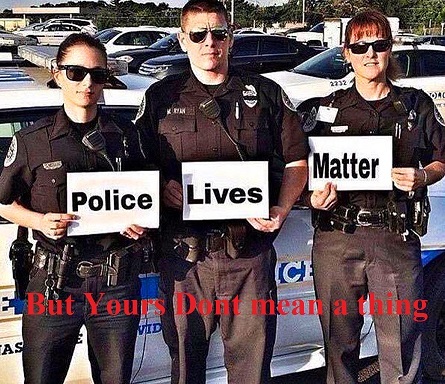 The #bluelivesmatter partisans continue to roll out propaganda that seeks to amplify the dangers of being a cop. According to their own statistics, 156 police officers have been killed by suspects between January 2014 and May 2016. Police advocacy groups inflate this number greatly by adding in non-pursuit traffic fatalities, on-duty heart attacks (Dunkin Donuting while blue) and all deaths of police dogs. Of the 60 non-human police officers that died in the same time frame, 22 perished from heat exhaustion on the pavement or in cars. These statistics are not separated as blue on blue crime. A complete accounting of unarmed citizens killed during the same time frame is not available as only a scatter shot totaling for ten of those months has been able to be compiled in a spreadsheet by activists. Using those statistics, The Mockingbird has arrived at the very tentative numbers of 517 unarmed black men killed in the same time frame. The recent murders of #HenryGreen, #AltonSterling, #PhilandoCastile and #JohnCrawford would not have counted towards the “unarmed” total, despite not a single one of them drawing a weapon or resisting in any way. Judging by two days of gunfire, legislation, increased surveillance and repression occurring right as America celebrates it's racially tiered freedom, the secret statistics and suppressed evidence will continue to point to an uptick of police murder. America has just official said that Blue Lives Matter and Black Lives don't. Obama's ink on the newest law is no drier than #AltonSterling and #PhilandoCastile's blood.